I’m back after a few days of just sitting back and taking care of a few things here and regrouping mentally. It has been a very strange week and I didn’t feel like I could even go through the motions of trying to celebrate much of anything. The Christmas spirit was lagging due to outside things going on and I needed to get it back. This has been a week of deep thoughts, quite a few tears and much exhaustion. For starters, two days ago you may have seen in the news that a tornado touched down in western Washington. Until 4 months ago, my daughter and her family lived around the corner from where that tornado touched down. One of her friends, a woman who cared for Baby R when my daughter was at work, had extensive damage done to her home, just across the street from the home that had the entire roof ripped off and flung to who knows where? Miraculously, nobody was hurt beyond a few cuts and bruises, and a community has come together to care for its own. Watching this happen has really renewed a deep love and respect for smaller towns. (Contrary to what Good Morning America said – this is NOT a suburb of Seattle – bite your tongue GMA! Geez! Look at a frippin map. It’s bad enough being this close to Seattle, much less to be lumped in as a suburb of it.) Just knowing that a few short months earlier and my family would have been personally impacted, knowing people who actually WERE impacted, it brings the vulnerability we, as humans, have in our place in the world. It’s humbling and somewhat frightening at the same time. I’m not suggesting we cower in fear of everything that possibly COULD happen, but it does make one think. You see, in this area we pretty much have our list of things we are mentally prepared to deal with: earthquakes, volcanoes, flooding, being at ground zero near multiple military bases . . . tornadoes don’t fit into that list, it’s not something any of us prepare to deal with. Maybe we should . . . who knows? I cannot tell you how many times I have looked at the sky and said that if we lived in a tornado area the clouds would make me run for cover. I’m sure I’m not the only one watching the sky now. Beyond this, we have been dealing with one wind storm after another, and by God’s grace, we have escaped any harm, or even power outage where we live – which on its own is rare. We can deal without power, we are set up for it, but watching the weather center for wind speeds has our nerves all jangled up. We are exhausted, have had very little sleep, and are very ready for calm days without even a breath of breeze. Today was the first time I have had to deal with strong winds at my new job. I work in a warehouse building made of metal. One tree fell and hit the back of our building, causing no damage, and I heard chainsaws out in the parking lot as crews cleared the way for cars to get in and out. There were times I thought the trees were just going to snap completely off if they bent even slightly more. The building was creaking and groaning like it was going to collapse. Quite a creepy sound, that I can say! There were good points too though. My boss gave me a lovely and very thoughtful gift for Christmas. She also ordered me a fancy new chair that is created specifically for tall people and is made where I can adjust the seat to keep the pressure off of my legs to help prevent blood clots and also ordered a standing work station for me, which will make some aspects of my job much easier. She even bought Moose an awesome toy! A giant stuffed hedgehog – which I know he will eviscerate in minutes, but he will love it for as long as it lasts. Finally, we got all of the stocking stuffers and they are sorted and ready for me to fill the stockings. I went overboard to the point that Hubby thinks I need a stocking intervention. Silly – you don’t interrupt stocking stuffing genius! You just don’t! I am bound and determined to SOMEHOW make all of these things fit. Today is the day that I need to not waste a moment of time because tomorrow Miss B and Big Brother E arrive! I’m pretty excited to see them. My to-do list is so long that I am even setting time limits for each task, so I can stay ahead of things. Eeeek! Where did the time go this month? Today I want to talk about Mary, the mother of Jesus. In all the Biblical accounts of her, they cover the outline of what happened, but I want to think about what this amazing and blessed young woman went through emotionally. Let’s think about the culture in her region at that time in history and create a picture in our minds and hearts of her story. Mary was betrothed to Joseph. The Bible doesn’t state specifically how old she was when she was given the blessing of carrying Jesus, but we must assume that, because of cultural norms at the time, that she was somewhere between 12 and 14 years old. At that time, when a couple was engaged to be married, their promises to each other were as binding as an actual marriage, and as unbalanced and unfair as it was, if the woman in the couple were to cheat on her betrothed, the punishment could easily have been the death penalty in the form of being stoned to death. (for those of you unfamiliar with the term except in the context of recreational drugs – this means that the community gathered around and threw rocks at the accused until they died; a horrible, cruel and painful death.) So here we have a young teenage girl, innocent and pure, from a poor family, engaged to marry a local carpenter. Mary was raised learning the prophecies and knew that God was going to send a blessing to His people, that He was going to save them with a Messiah, so when the Angel of the Lord appeared to Mary to let her know that she was going to conceive the Son of God, she was terrified, but the purity of her faith opened her heart and mind to the blessing being given to her. In the cold light of day though, what did she go through? She was unmarried, betrothed to Joseph . . . and she was pregnant. Unmarried pregnant girls are common today, so much so that nobody really gives them a second thought, but at THAT time, this was a HUGE scandal! HUGE! Everyone, justifiably, assumed she’d either cheated on Joseph, or she and Joseph had jumped the gun and consummated their relationship before their marriage – both a big no-no. Joseph was publicly humiliated and had a big decision to make. Was he going to break it off with Mary, effectively divorcing her and condemning her to a life of being unmarriageable, was he going have her killed, or was he going to just deal with it, marry her anyway and live a life with people thinking he was a fool to marry a woman carrying someone else’s child? What to do? I’m sure his family and friends were giving him all sorts of advice, and that the public condemnation of Mary was loud and perhaps even vicious. “Good” people would have crossed to the other side of the street and she would have been ostracized. It got so bad she went to live with her relatives for awhile. Joseph in the meantime was visited by an angel as well and being a man of faith who was in love with Mary, he accepted the responsibility God gave him, and he stayed with Mary, with the intention of being the earthly father to the Son of God. Heavy responsibility! This likely gave the impression that the child was his, which would have – maybe – slightly alleviated the scorn, since they WERE betrothed anyway. What a LONG nine months this had to have been! The time came for Joseph and Mary to travel to Bethlehem to report for the census. This census was required by the Romans, and no excuses were acceptable, which is why Mary found herself traveling about 70 miles on foot and by donkey, to Bethlehem. I don’t know about you, but for me, when I was that far along, there is absolutely NOTHING that would have felt worse than that trip when I was so close to delivering. She had to have been miserable! I’m sure her back ached, her feet were puffy, she was short of breath and every little bit she had to stop to do her business behind a rock somewhere. It was a LONG, difficult, miserable trip. When they arrived in town, it was packed to the rafters with people who were ALSO there to report. Every available space was full of travelers. Think about how cram packed cities are when the Olympics are in town, or Super Bowl! You have to make reservation months, even years in advance, just to insure you have a place to stay. They didn’t have this option back at that time, so it was first come first serve, and since traveling was slow with a woman in the end stages of pregnancy, by the time Joseph and Mary arrived it was too late to find an inn. I’m sure Joseph knocked on many, many doors trying to find space and he had to have been feeling desperate. Mary was in labor – had to have been to have given birth so soon after arriving – which means her contractions had started and she needed to lie down as soon as possible. Finally, after what was a really long search, they found an innkeeper who would allow them to stay in the stable with the animals. A humble place to be sure but think about it. It was warm and staying with animals wasn’t a big stretch in those days. People’s farm animals meant the difference between life and death for them. They took care of them and spent a lot of time with them. So here they were, in a warm barn, heated with the body heat of the animals staying there, and in this humble space, Mary delivers Jesus, the Son of God, Savior to the world, with the help of her husband, Joseph. They wrapped the baby in strips of cloth that Mary would have packed to bring with her, knowing that she was so close to delivering. These swaddling clothes were something that mothers have used for hundreds of years, securely snuggling the baby up where he was warm and would feel secure. She was exhausted from her trip and from giving birth, so Jesus was laid in the manger – a feeding trough essentially – so she could rest. We see traditional nativity scenes showing the manger as a wooden box type object, but if you look at structures of those times, it was likely a cut out stone indentation in the wall of the stone stable. Either way, it was a humble place for the Son of God to lay His head in the first hours of His life. However, this difficult pregnancy, the trek to Bethlehem and the basic nature of their lodging, all worked together to fulfill the prophesies and bringing to us, the world, the Savior . . . The Messiah. I am grateful that God chose such a wonderful young woman to raise His Son, and I am humbled by her graciousness, her sweet spirit of acceptance and her strength. Would that we all could give ourselves over to God in such a way . . . the world would not be in the place it is today. This video from The Nativity Story, with the song Breath of Heaven, sung by Amy Grant always touches my heart. Please, if you have a few minutes, contemplate Mary and what she went through, so she could fulfill the purpose God gave to her. 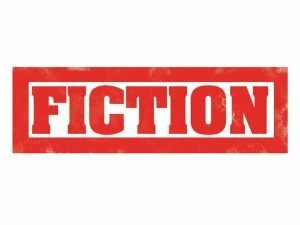 Celebrate Short Fiction Day – (always on Winter Solstice) – This is the day we have the least amount of daylight each year. Some people may think of that as depressing, but it’s really not! Know why? Because you can use this long winter night to read a short fiction story! Short stories have been around since people were able to tell a story about anything that strikes their imagination. Pick out a favorite story, or find a new one, curl up on this long, winter’s night and enjoy a tale spun from someone’s wildest imaginings. It’s a good night for it. 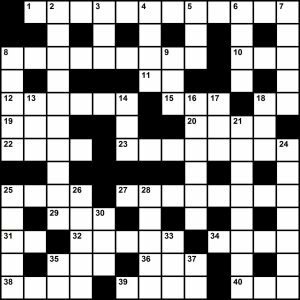 Crossword Puzzle Day – Happy Birthday to Crossword puzzles! These challenging word games are enjoyed by millions around the world. The very first ones were published in England in 1913 in children’s books and magazines. Crossword puzzles are not only fun, but they can help delay the effects of dementia or sharpen the brain for problem solving. 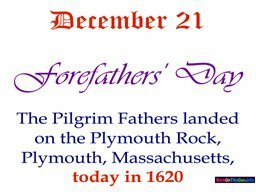 Forefathers Day – Today we commemorate the day the pilgrims landed at Plymouth Rock in 1620. It was a difficult time for the people of Europe, as they were told that they had to believe and worship God in the way they were told to, not how they felt in their hearts. So, this group of people left for the New World to escape religious persecution and live their lives and their faith as they wanted to. Now, the pilgrims set sail in two ships, the Speedwell and the Mayflower, but the Speedwell was leaking so badly that they were forced to return to England, and cram everyone onto the Mayflower, which was what made it much later than they’d planned. This put them setting sail in the late fall. They also had to deal with strong fall west winds, delaying their arrival even further. Ultimately, they landed on Plymouth Rock, Massachusetts just before Christmas. Forefather’s Day is celebrated in New England, but if you aren’t from there, chances are you haven’t heard of this day before now. Don’t you wish they had the ability to do video footage of these types of events? I can’t imagine the hardships they had to endure at home, forcing them to leave the only place they’d ever known, to set sail with far too many other people to a destination that was completely foreign to them. I have to respect their choice though – for they stood up for what they believed, no matter the consequences. 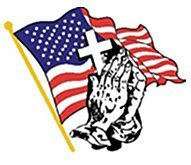 Sadly, I look around our own country and the freedoms our forefathers sought and sacrificed for seem to be being stripped, and we have no place new we can go to seek the freedoms that we are losing. This means we need to take a stand now, to retain the freedom of religion, freedom of speech and freedom to make our own choices to live our lives as we see fit, before the persecution starts. Look to other lands and see what they are going through. I don’t want that for us . . . do you? We made a good start by electing a new President who actually loves our country. He’s made a lot of progress, but there’s a lot of work to do. We can help out by making sure we vote in other people as a support network who value this nation as much as our President does and want to make it strong again. 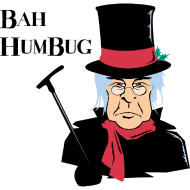 Humbug Day – we all know someone who is a Scrooge – someone who frowns and fusses about how much they just HATE CHRISTMAS. 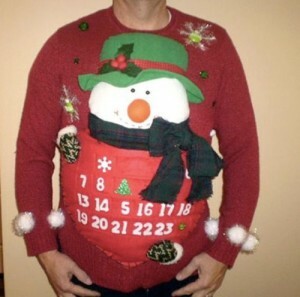 I can’t understand those people, because honestly, Christmas truly is my favorite time of the year. Everything it means, the history and purpose behind it – it is special in its entirety. But to a Scrooge, they just want it to be over, the fuss and decorations, the scurrying about, the frivolity and fun . . . they want it gone and life to go back to normal. Today is for those people, they can vent to their little heart’s desire – letting out all of their frustration about their feelings for Christmas. 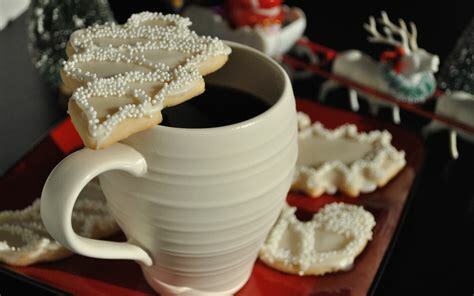 If you are feeling stressed, even if you LOVE Christmas, let your frustrations out too. You’ll fit right in! Just don’t let it get to you and turn you into an actual Scrooge. Bah Humbug Day is just a stress reliever, so take it as such. As for the REAL Scrooge’s, I feel their childhoods had to have been sad and completely deprived not to take joy in this amazing time of year. If you’re a Scrooge and really don’t want to be, maybe use this day to be a turning point to enjoying Christmas – do something for someone else to make them smile, and it may just melt your heart a little bit and make this day as special to you as it is to the rest of us. Happy Humbug Day! I may have to celebrate by watching A Christmas Carol later. 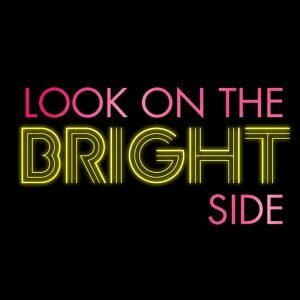 Look on the Bright Side Day – Sometimes when life is going crazy, the world is spinning off of its axis and we can’t seem to find the time, finances or enthusiasm to do everything, it’s difficult to see the bright side of things. It is so important to try though! If we merely look at the doom and gloom of everything, we can get ourselves down and feeling terrible, which saps our energy and our spirit. Trying to find something good in every situation can bolster our spirits and make life feel less bleak. Try looking on the Bright Side today! It really is a great thing! 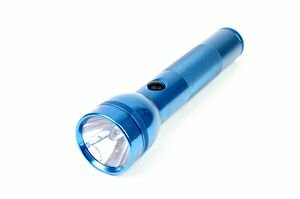 National Flashlight Day – Today is the Winter Solstice, and what that means is it is the shortest day, and longest night, of the year. And you don’t want to be left in the dark! Flashlight Day was created to get prepared for being in the dark. Put new batteries in your flashlights; put them around your house where you can easily find them in case of a REAL dark time when the power goes out – which after yesterday’s storm a lot of people are in the dark in our area – put one in your car. I have one in my purse that I need to actually recharge. You never know when you will need one, and what better time to do that than the darkest day of the year to get prepared for when that need should come up!? Did You Know? The flashlight was invented in 1898 by Joshua Lionel Cowen. However, this wasn’t his greatest invention. He also invented the Lionel train. 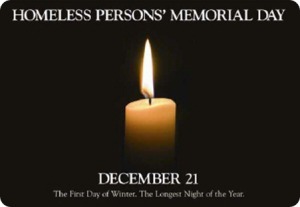 National Homeless Persons’ Remembrance Day – This one tugs at my heart. Communities throughout the country will honor the memory of people who passed away in 2014 while homeless. Honoring the homeless who have died this past year and remembering those still struggling to find a place to sleep is something that various organizations join up to do, by hosting National Homeless Person’s Memorial Day candlelight vigils. “Mortality rates for homeless people are three times the rate for others, and life expectancy is around fifty years – about what it was for everyone in 1900,” said John Lozier, Executive Director of NHCHC. “These high death rates point to the terrible conditions of homelessness, and to serious problems of health care access in America.” Homeless people are not just in danger of losing their lives to disease and exposure, but it is horrifying how many homeless people are murdered. Rather than being treated with kindness by passersby, they are often the targets of cruelty by so many. When I was commuting to Seattle, I had to pass right through Pioneer Square, which can be a little creepy after dark (or before sunrise). I had to pass right by all of the benches that had the homeless folks who called their spots home, and in what was typical of many people, I’d look straight ahead and pass by as quickly as I could. One day, after I’d had a day off, one elderly gentleman, said good morning to me and said he’d missed seeing me the day before and had been worried that something had happened to me. I had to stop and go back to look at him and ask him what he meant! This old guy had never asked me for anything, we’d never spoken, but he noticed the regulars, when they went by and sort of watched over them. We talked for a few moments, and with a lighter heart, and feeling like I knew someone in the square, I went to work. On the way home, I took him a treat that I’d picked up on my way out of my building. The smile that wreathed his weathered face made me feel so good. Making him a sack lunch when I made my own became a daily routine, taking him extra the day before my day off so he’d have something to tide him over. Every day his gratitude just filled my heart. He’d tell me a joke, or comment on the weather, or just ask how I was every single day. He was special, and I really liked him. One day I went by his bench, with his sack lunch for him, but he wasn’t there. His blankets and a couple of things he always had with him were there – neatly folded up on his bench, but he wasn’t there. I set the lunch there, thinking he had gone somewhere to go to the bathroom – though the homeless generally take all of their earthly belongings with them when they go anywhere, and went to work. That afternoon I saw that all of the blankets he’d had were distributed around with the other people who lived there. This didn’t make me feel very good. I walked up to the nearest one, and asked where he was, and the news I got made me feel so sad. He had gathered enough change to go across the street to Starbucks for a coffee and to use the restroom and had a heart attack right there in the store. He passed away immediately. He died with no family, nobody but the homeless and a few people who saw him daily, to mourn his passing. This man had a beautiful heart, and an even more beautiful spirit, and spread that to everyone he met for every day that I knew him. Do not discount the homeless as not worth knowing, because they are people who had life hit them hard, but that doesn’t discount their worth as people. 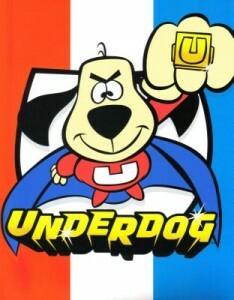 Underdog Day – We all cheer for the underdog in the movies, right? I know I do. This day was set up in 1976 to celebrate the heroes in stories that aren’t usually given any credit for what they do. For example, in Sherlock Holmes, Dr. Watson is treated as a side kick. In reality he has a great deal to do with cases being solved and he doesn’t get the credit he deserves! For today at least, Dr. Watson can be a hero. The original meaning of the word “underdog” actually started from sawsmen who built ships. Planks of wood called “dogs” were put over the top of a pit. Two men would have to supervise those planks being placed, so one man would stand on top of the planks, and one would stand underneath the planks in the dark pit, covered in sawdust. Poor guy in the pit was known as the “Underdog”. Fascinating! I had no clue! 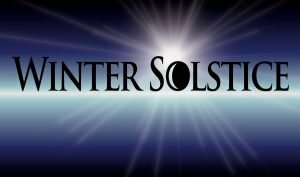 Winter Solstice – Today is the Winter Solstice, which is the shortest day of the year. What happens is that the sun’s daily maximum height in the sky is at its lowest, and the North Pole is tilted furthest away from the sun. The result is that this day has the least number of day light hours and is the longest night of the year. The Solstice is celebrated by druids and pagans as the re-birth of the sun for the new year. Each year in the UK thousands of people gather to mark the occasion at Stonehenge in Somerset. The date for Winter Solstice is not set though – sometimes it arrives earlier, and sometimes later. A solar day is rarely 24 hours exactly, which makes the sun lag behind the clock for part of the year, and speeds ahead for another part of the year. The length of a solar day varies because the axis of the Earth’s rotation is tilted (23.5 degrees from vertical) and because its speed fluctuates as it orbits the sun, going faster when it is closer to the sun’s gravitational pull and decelerating when further away. It takes awhile for the clock and the solar days to line up, resulting in evenings having their earliest sunset a couple of weeks before the shortest day, and mornings getting darker until a couple of weeks after. Yule – This one could get long, but it’s fascinating so I’ll try to condense it down, while not taking away from the historical details. First, I’ll tell you that much of the historical/mythological information comes from The Edda – which is a collection of ancient Norse poems used to pass down the mythological stories from one generation to the next. The Edda was written in, or about, the 13th century. 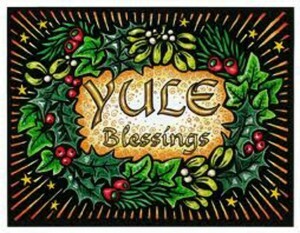 As early as two thousand years before Christ was born, Yule-tide was celebrated by the Aryans – or Nordic tribes. These people were sun-worshipers and believed that the sun was born each morning, rode across the upper world, and sank into his grave at night. As the year progressed and the daylight hours grew shorter, these people believed that the sun’s power was diminishing, and they were afraid that it would eventually be overcome by darkness and forced to stay in the underworld. After several months of shorter, darker days, the sun would grow stronger and stronger, with more daylight hours each day, they believed that the sun had been born again. This is why at Hweolor-tid (or the turning time) there was great rejoicing at the annual re-birth of the sun. There are many myths that all tangle up around this time, of gods and goddesses who traveled the world and set up kingdoms, but I won’t go into those – it would get too long. There is one though, that ties in with our current use of mistletoe as part of our Christmas celebrations that I thought was pretty interesting – and in the end it all ties in to Yule celebrations. The Edda tells an ancient story of Balder, the sun-god, who was killed because of the jealousy of Loki (fire). Loki knew that everything in nature except the mistletoe had promised not to injure the great god Balder, so he searched for the mistletoe until he found it growing on an oak tree on the eastern slope of Valhalla. He cut off some and went back to the place where the gods were amusing themselves by using Balder as a target throwing stones and darts, trying to strike him with their battle axes. All of the weapons were harmless, for nothing could injure Balder. Loki gave the twig of mistletoe to the blind god, Höder, helped him aim, and told him to throw it. The mistletoe struck Balder, and it pierced through him and he fell to the ground, lifeless. There was a lot of excitement among the gods and goddesses gathered when Balder was struck dead and sank into Hell. They would have slain the god of darkness had all of this not happened during their time of peace, which was never to be desecrated by violent acts. This was supposed to be a season of peace on earth and good-will to man. Now I told you that story to give you the general mind-set around the time of the birth of Christ – these were the things that the ancient people believed, celebrated and worshiped – among many others. On to ancient Yule traditions. These traditions are usually attributed to time of the angels singing at the birth of Christ, but according to a much older story, the idea of peace and good-will at Yule-tide was taught centuries before Christ was born. According to The Edda, gift from gods and goddesses were laid on Balder’s bier and he turned around and sent gifts back from the realm of darkness into which he had fallen when he was hit with the mistletoe. Even with all of that though, it is likely from the Roman Saturnalia celebration that the ancient yule traditions of the exchange of presents and the party spirit came about. The Yule-Tide time was very merry for the ancient people who ate feasts, drank and danced in honor of the sun, the god of light and new life. When messengers went throughout the various countries bringing the word of a new religion and the birth of a Son who brought light and new life into the whole world, the ancients tried to retain as much of their established yule traditions as possible but gave to the old-time festivals a finer character and significance. Since Christ’s birth wasn’t actually recorded in any official capacity, there wasn’t any certainty as to a specific date, so the early Christian fathers very wisely ascribed it to Yule-Tide, changing the occasion from the birthday of the sun, to that of the Son. For awhile the birth of Christ was celebrated on dates that varied from the first to the sixth of January, on the dates of other religious festivals like Jewish Passover, or the Feast of the Tabernacles, but the 25th of December, the birthday of the sun, was always the favorite date. Pope Julius, who reigned from 337 to 352 A.D. investigated the matter, and considered it settled beyond doubt that Christ was born on or about the 25th of December, and by the end of the 5th century, that date was generally accepted by all Christians. This transition from the old celebration of Yule-tide to the new way of doing it happened so quietly and naturally, that it made no great impression on the minds of the masses, so nothing authentic can be learned of the early observance of Christmas. Holly, laurel, mistletoe and other greens that were used by the Druids still were used as decorations of the season, not as a shelter for fairies as they were in former days – but were now seen as emblems of resurrection and of immortal hope. The glorious luminary of day, whether known as Balder, Baal, Sol, or any other of the many names it was called by primitive peoples, still makes the hearts of mortals happy at Yule-tide by “turning back” as of old, only today it gives way to God, in whose honor Yule-tide is now observed. Even though we are a little more than a week out from the New Year, I thought I would connect these together, since we are so close, and I may forget to come back to it. New Year’s Day as a feast day is one of the oldest, if not THE oldest, on record. It was mentioned by Tacitus in the First Century, but first mentioned as a Christian festival in about the year 567. In Rome the day was dedicated to by Numa to honor the god Janus, for whom Julius Caesar named the month January. Numa said that it should be observed as a day of good-humor and good fellowship, during which all grudges and hard feelings were to be forgotten. Sacrifices of cake, wine and incense were to be made to the two-faced god who looked forward backward. People were expected to give to the god the best they had to offer. It was the greatest occasion of the entire year and even today is a huge celebration. Various dates have been used for New Year’s Day, from March 1st to December 25th. It was as late as the 16th Century before the date of January 1st was universally accepted as the New Year by the Romans. There are nations that go by the Gregorian calendar, such as Russia and Greece, that observe New Year’s 13 days later than those who follow the Julian calendar. Among northern nations the love of fire and light started the custom of having bonfire to burn out the old year, destroying all evil connected with its past. Light has long been an expression of joy and gladness among many different nations of people. The Greek and Latin churches still call Christmas the “Feast of Lights”, making it a period of brilliancy in the church and in the home. Protestants cover their Christmas trees with lights and build a glowing fire in their hearth (provided we have one of course). 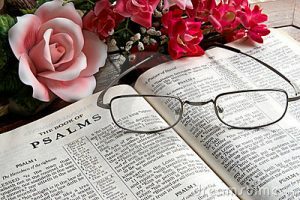 So many of our current holidays, especially this time of year, are infused with features from our pagan forbears, and the fathers of the early church showed wisdom in retaining the customs of these pre-Christian festivals but filling them with the spirit of the new faith, making them examples of a purer love and hope. I have heard of many people who refuse to celebrate BECAUSE the origins of many traditions are from pagan origins, but seriously, God knows our hearts, and He knows the reason we celebrate. There is nothing wrong with including traditions of the ancients, with all of their rich heritage and beauty, with our current practices, as long as the reasons for these celebrations honors our beliefs and the reason for this season. I know that got really long, but there was just too much information to leave anything out! 1937 – “Snow White” premiered at theaters. 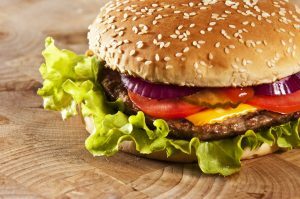 National Hamburger Day – There are many different days that have us celebrating hamburgers, and why not? They are delicious! I rather wish I’d taken a look at this ahead of time but it’s too late now. I just put a roast into the crockpot for tonight’s dinner. We have the grandkids tomorrow, maybe a hamburger will be on the menu for their visit. I’m sure they’d like that. So far today I packed hubby’s lunch, but he didn’t end up needing it. The power is still off at his shop, so he stayed home. I also made him a smoothie, straightened up the kitchen, stuffed the stockings, wrapped a few miscellaneous gifts and sat down to finish up here. Now I need to get busy again if I’m going to have everything done in time to bake some treats for the kids. Enjoy your day and if you don’t have power back on yet, I hope you do soon. God bless you and I’ll see you tomorrow.